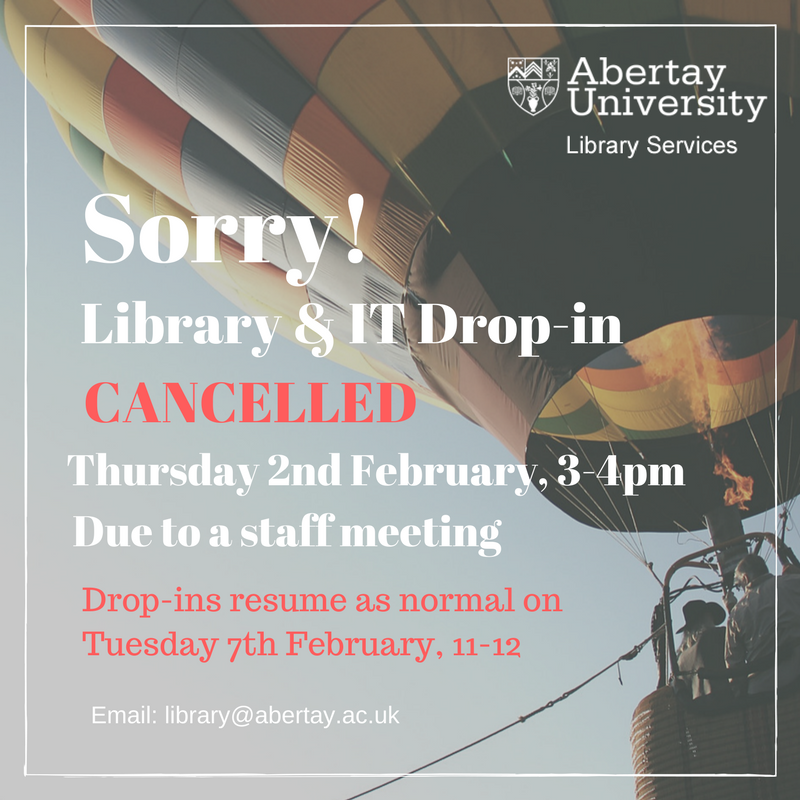 Our Library and IT drop-in session on Thursday 2nd February (3-4 pm in the IT Training Suite) has had to be cancelled in order for staff to attend a meeting. Our drop-ins resume as normal the following week. They run three times a week during term time: 11-12 on Tuesdays, 12-1 on Wednesdays and 3-4 on Thursdays on level 2 of the Library in the IT Training Suite. Feel free to pop along and see us if you’ve got any questions about referencing, RefWorks, finding information for coursework, using LibrarySearch or specialist Library databases and resources, formatting documents (table of contents etc.) and loads more! There’s also help with Pebblepad on a Wednesday. Please remember that a Librarian is always on-call Monday-Friday from 9am to 5pm so even if you can’t make it to a drop-in session, there will be someone on hand to help with referencing and resource queries. Just ask at SEZ and they’ll contact the on-call Librarian for you. 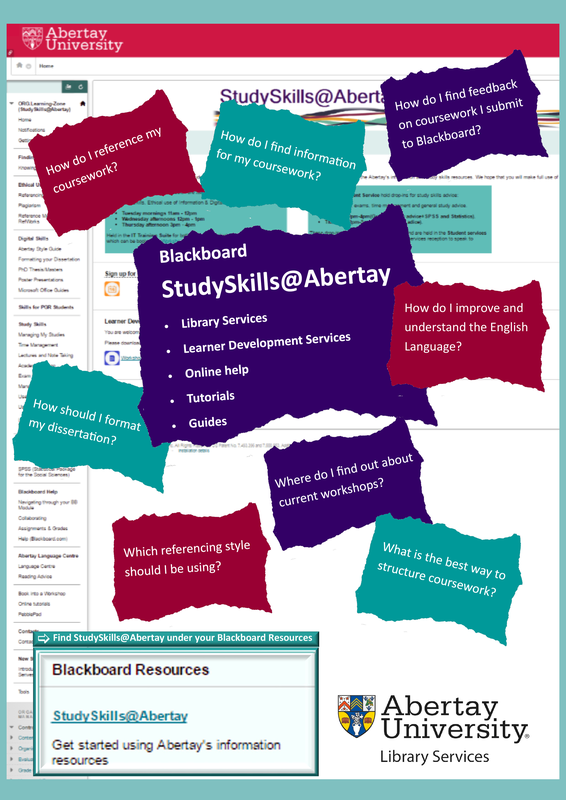 Abertay Library on YouTube – instructional videos on using LibrarySerach, RefWorks, MS Office products and much more! Our Library & IT drop-in session is cancelled tomorrow, Tuesday 13th December, 11-12, due to a staff meeting. Library Services will be unavailable all day but if you have any urgent queries, please email us on library@abertay.ac.uk or go to SEZ on Level 1 of the Library. We’ll get back to you as soon as we can on Wednesday. Our drop-ins on Wednesday 14th December (12-1) and Thursday 15th December (3-4) will go ahead as normal in the IT Training Suite, Level 2, Library. So, please do pop along and see us if you need help or advice. Got your first assessment for the new term? Not sure which online resources and databases are best for your coursework? Need help referencing your sources? Looking for advice on how to use Word, Excel or Powerpoint? The Digital Skills Officer and Academic Librarians offer help and advice at our weekly drop-in sessions. The Tuesday drop-in now includes SPSS support. No need to book in advance, just pop along with your queries and we’ll be happy to help you out.